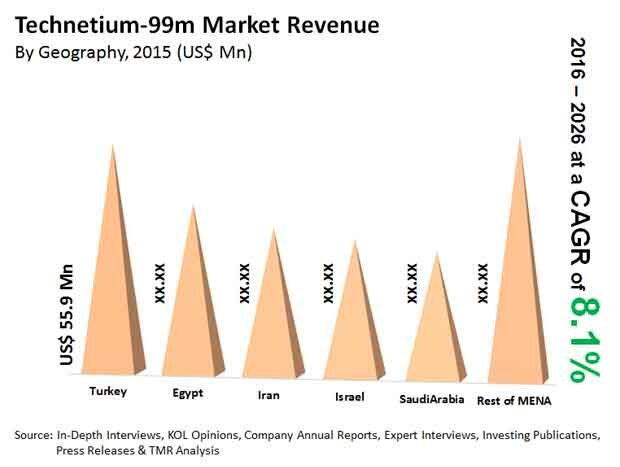 Leading players in the Middle East and Africa technetium-99m market, including General Electric Company, Siemens Healthineers, and Sumitomo Heavy Industries, are focused on research and development activities with the view of the maintaining their diverse product portfolios with a vast range of innovative products. These companies being internationally invested entities, their rate of research from across the globe, is expected to result in the rising market share for technetium-99m in the MEA region, observes Transparency Market Research in a recent report. According to the report, the MEA technetium-99m market is expected to expand at a CAGR of 8.1% over the period from 2016 to 2026, reaching US$636.1 mn by the end of 2026 from US$273.3 mn at the end of 2015. In terms of isotopic application, the segment of gamma cameras accounted for the dominant share in the MEA technetium-99m market in in 2015. The segment is also expected to retain its dominant spot and create an incremental opportunity of US$164.7 mn from 2016 to 2026. The SPECT segment, however, is likely to outpace other segments when it comes to growth pace, exhibiting a 9.0% CAGR over the forecast period. Of the key end-use segments, the segment of hospitals is presently the most attractive in terms of growth prospects over the report’s forecast period. Geographically, the market in Turkey accounted for the dominant share in the overall market in 2015 and is likely to rise to US$151.1 mn by 2024. The country-wide market is likely to exhibit a promising CAGR of 9.6% over the forecast period. The rapidly rising pool of patients suffering from a number of chronic and non-communicable diseases in the Middle East and Africa region and the scenario is pushing government and private healthcare organizations to strengthen its capability of meeting this growing demand for treatments. With conditions such as diabetes, cancer, and heart diseases witnessing a rapid rise in the region, the healthcare industry, including hospitals, medical organizations, and other varieties of healthcare centers are placing a special importance on treatment and development procedures. This includes the use of technetium-99m in imaging technologies, thereby driving the growth of the MEA technetium-99m market. This scenario will likely continue to drive the technetium-99m market in the MEA region for the coming years as well. Reports shown by organizations such as the CDC and the WHO indicate that the overall number of people suffering from chronic illnesses and heart disease is showing an inclined curve over the next few decades, thus driving the overall demand for technetium-99m. The market is also likely to benefit from the swift rate of advancements in technology that are being brought into the region. This applies specially to imaging technologies, where there is a high usage of technetium-99m.